George Armstrong, a pioneer in whitewater rafting, took his first rafting trip in 1962 and has been riding a wave of success ever since. 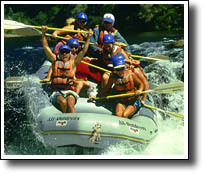 All-Outdoors Whitewater Rafting, the Walnut Creek based company he founded, has been selected as one of the "Best of the West" entries in the February 1999 issue of Sunset, The Magazine of Western Living. "We are very thrilled," says son Gregg Armstrong, All-Outdoors president and co-owner. "We knew what we were doing was unusual for a long time." 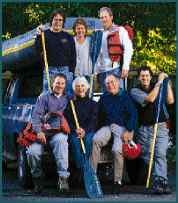 For 35 years, the Armstrongs, including their five children, have led adventuresome types over the rapids of rivers in California and Oregon. George Armstrong was raised in Oakland- a city kid. But by the time his children were young, Armstrong's interest had blossomed and his adventures were a family affair. Gregg Armstrong remembers tagging along on rafting trips as a boy of 5, and says he and his siblings have enjoyed the thrill of skiing, backpacking, kayaking, mountain climbing and scuba diving. All-Outdoors is still family-owned, but has grown to include 150 guides who lead rafting trips on 12 rivers- from the moderately difficult south and middle forks of the American river to the expert runs of the Upper Tuolumne. Armstrong says All-Outdoors offers the whitewater adventure that clients seek, but also educates rafters about their environment on its one-to-three-day trips. "There's always been a disciplined approach," he says. Armstrong says the pioneers of whitewater rafting started with great fear and respect because they were in an unknown frontier. Due to George Armstrong's early involvement in whitewater rafting, the company holds permits to operate runs on the American, Stanislaus, Merced, Tuolumne, California Salmon and Klamath rivers. All-Outdoors runs trips for almost any cost and skill level, ranging from a half-day excursion at $99 and a three-day interpretive trip for $529, to customized trips on the rivers. Everything is included, and clients need only bring their adventuresome spirit. All-Outdoors offers rafting trips for some 15,000 clients each year from April-October. The most popular run is the south fork of the American River, says Armstrong. For that trip, rafters spend about 30 minutes on shore learning about safety, paddling techniques and how to sit properly in the raft. Armstrong says All-Outdoors prefers to start clients out on their whitewater trips with a conservative approach. "You have to watch that you don't push people too far," he explains. "We have to ask people what they do." All-Outdoors was questioned by Sunset editors for its "Best of the West" section, says Armstrong, noting that there were several conversations before the final selection of featured whitewater rafting companies. He says the article prompted a number of new callers, as well as congratulatory calls from longtime clients. The business has been head-quartered in Walnut Creek since its founding in 1964, though All-Outdoors maintains its fleet of rafts and equipment at sites along the rivers. George Armstrong has called Walnut creek home since 1945, when there was only one stoplight in the city- but he worked in Concord before trading in one classroom for another. Armstrong taught mechanical drawing at Mt. Diablo High School in Concord in the early 1960's, and he first offered rafting trips to a small group of teens who were going through some difficult times during their adolescence. "It was a huge turnaround for those kids," says Gregg Armstrong, noting that some of the company's first guides were the students that George Armstrong took on those trips. In the early years, the majority of All-Outdoors rafting trips were two days, but now people are looking toward the one day trip. Whether clients choose the long or short version, whitewater rafting is a social, thrilling and educational experience.